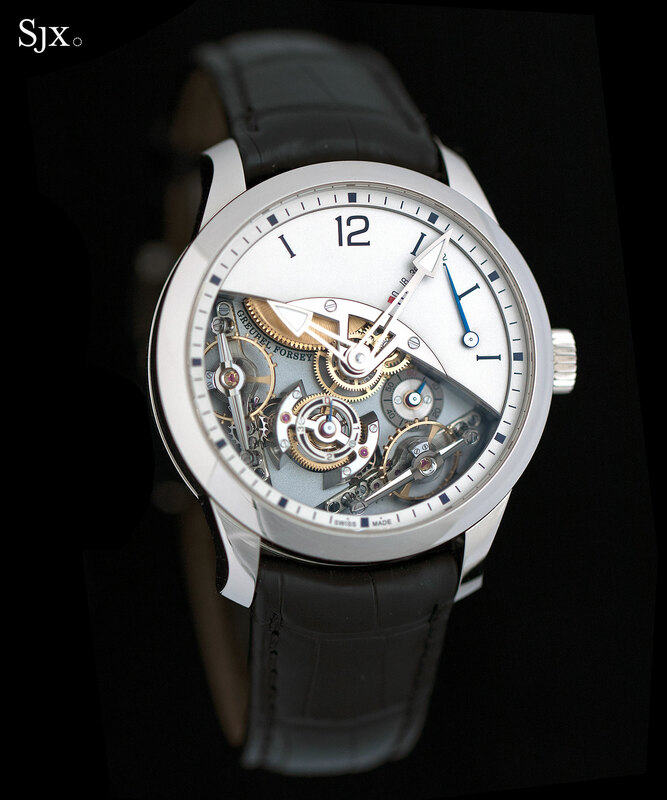 Greubel Forsey's latest equipped with twin balance wheels is a gorgeous example of horological architecture. The Double Balancier à Différentiel Constant exemplifies what Greubel Forsey does best, highly finished complicated movements constructed in an architectural style, with the intricacies of the movement revealed on the dial. Unlike the entry-level Signature 1 launched at the same time, the Double Balancier à Différentiel Constant is a no-expense-spared wristwatch priced at well over US$300,000. 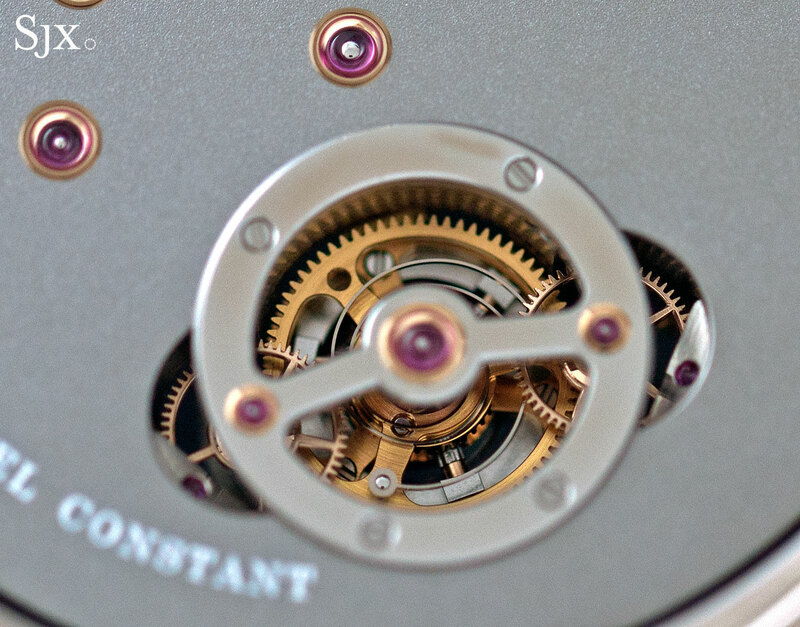 Double Balancier à Différentiel Constant translates as “double balance wheels with constant differential”, concisely summing up the watch. 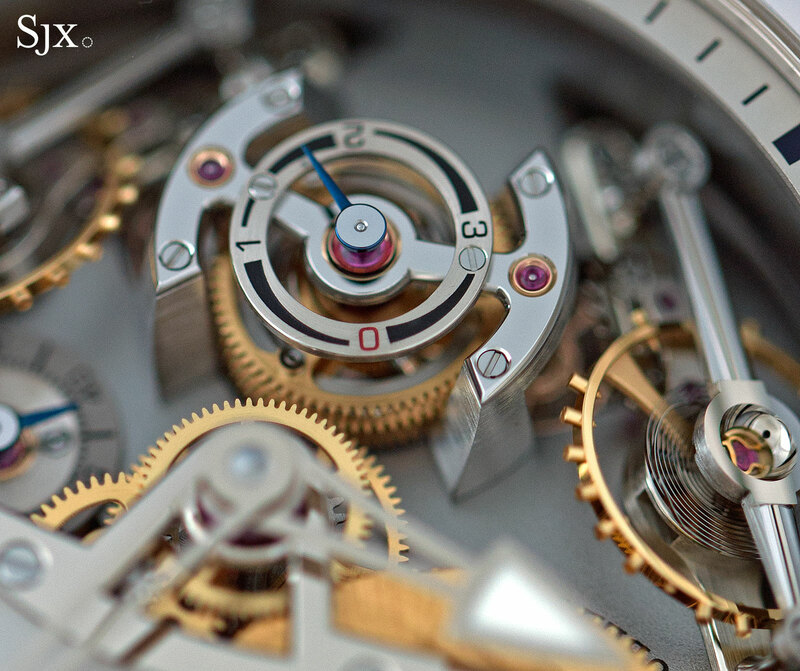 Featuring twin balance wheels linked by a differential, the Double Balancier is an evolution of Greubel Forsey’s original twin balance wristwatch introduced in 2013. While mechanically similar, the new Double Balancier is vastly more appealing with a strikingly mechanical aesthetic. Half the dial is cut away to reveal the pair of inclined balance wheels, the differential in between, and the gearing that links it all together. The rationale behind the movement is simple: the two inclined balance wheels are always in different, complementary positions regardless of the position of the wearer’s wrist, so when their individual rates are averaged out by the differential, the resulting performance is better than that a single flat balance wheel. 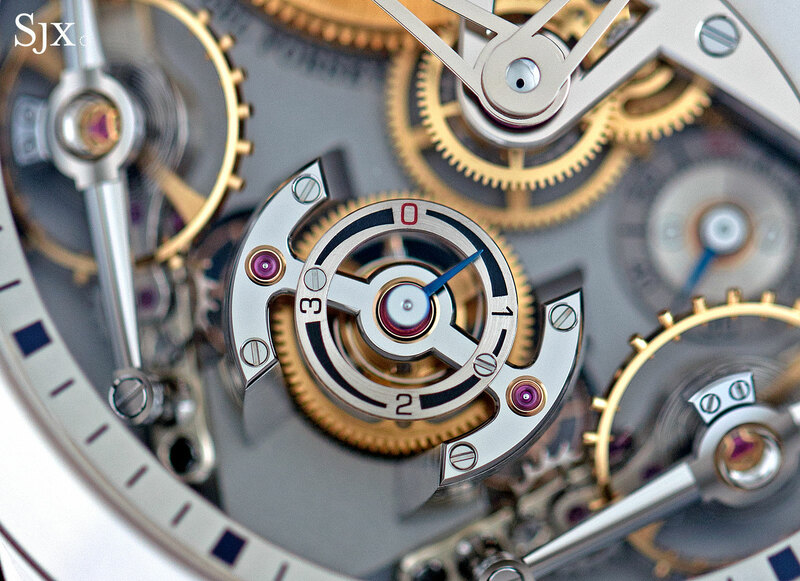 All of the mechanics contained within the twin regulators and constant force mechanism raise the question: is the gain in timekeeping worth the complexity as well as friction generated by all the gears? 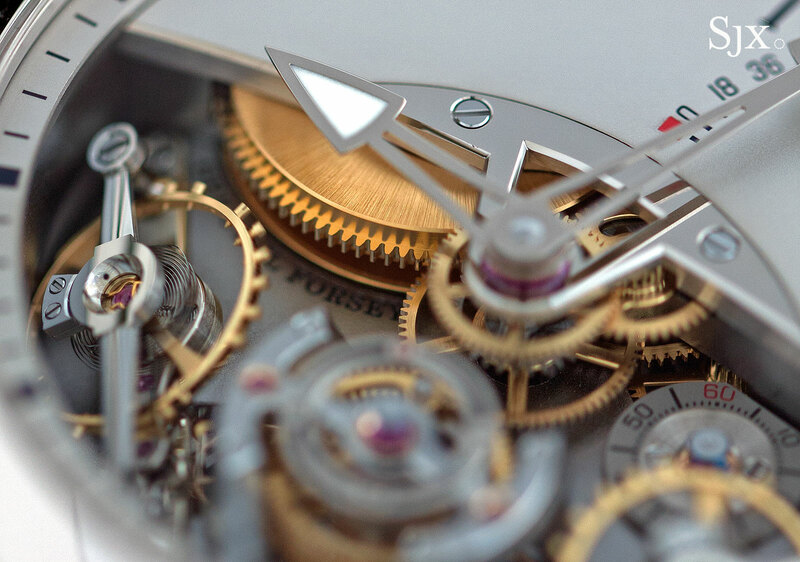 According to Stephen Forsey the answer is yes, but regardless of the answer the Double Balancier is a compelling exercise in modern, high-end watchmaking. 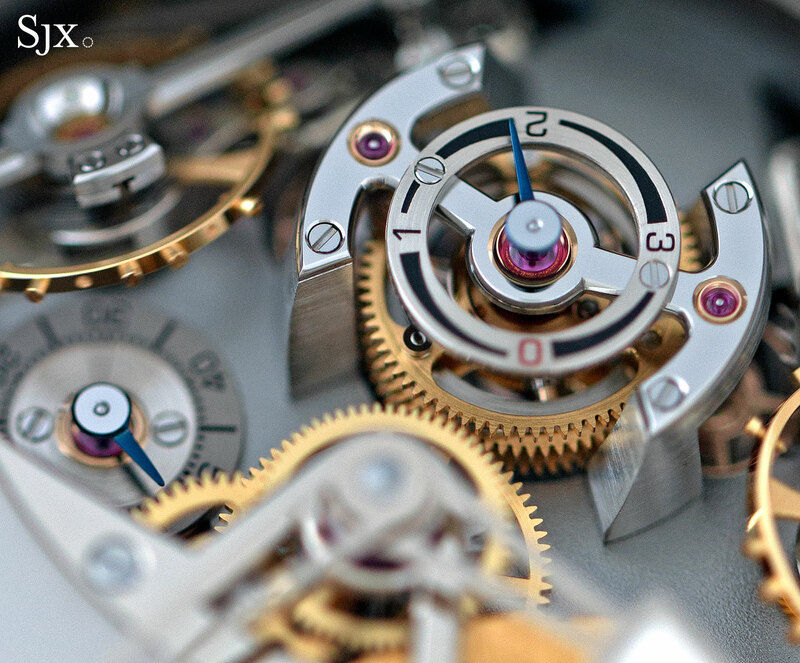 The three-dimensional movement is engaging at arm’s length, but as is expected of Greubel Forsey, the decoration on every component is exemplary. Up close every part looks extremely good; the movement is magnificent to behold. 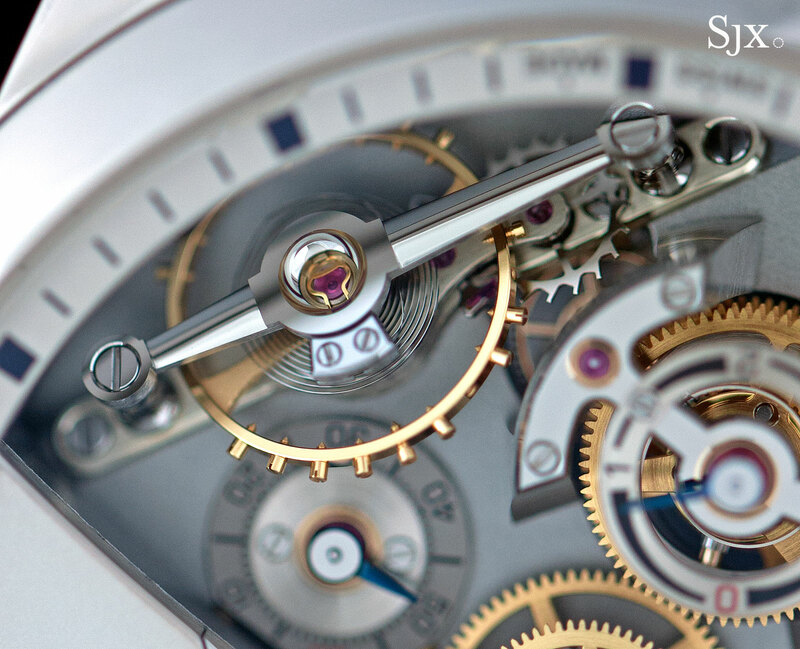 The movement laid out in impressive, three-dimensional detail in the front. Each balance wheel is secured by a long, rounded steel bridge that’s mirror-polished and mounted on a straight grained plate below. The differential is a stack of three of gears in the centre, held in place by an H-shaped bridge that’s almost like a miniature turret. Admire the rounded arms of the balance bridge, with the sharply defined corners at the ends. 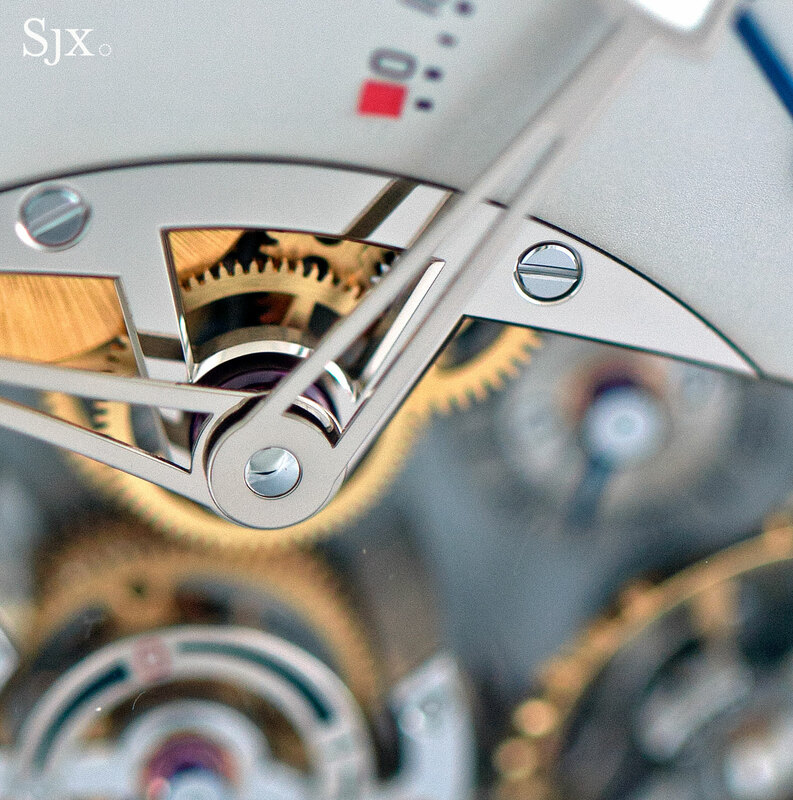 And just above that sits the gilded wheels of the gear train, connected to the hour and minute hands, which are themselves mounted on a black polished steel plate. Visible just beside the hands are the twin barrels, one on top of the other, which together provide a 72-hour power reserve. As the mainsprings empty, however, the torque they deliver to the twin balance wheels begins to dip. To compensate for that declining energy, a constant force mechanism has been installed on the differential. The barrels are visible just below the arrow-tipped hour hand. 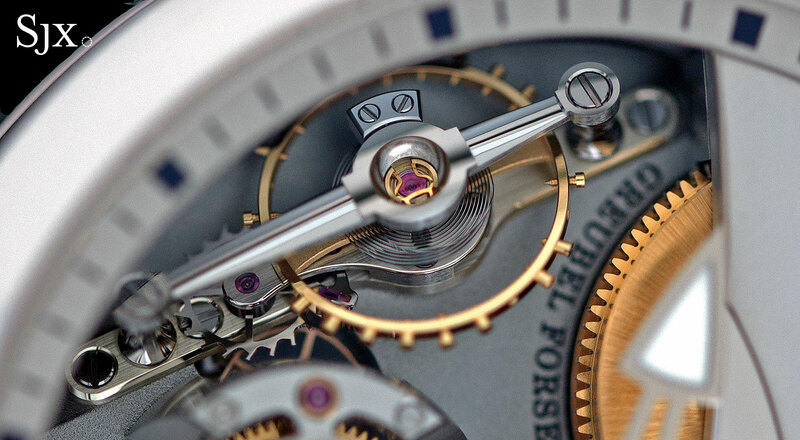 This takes the form of two tiny springs mounted on the differential gears, visible on the front and back of the watch. It’s a four minute constant force mechanism, meaning it stores a small amount of energy, four minutes worth actually, and releases the same small amount each time. So even as the mainsprings wind down, the energy to keep the watch running remains constant, thus keeping both balance wheels beating at a healthy amplitude. 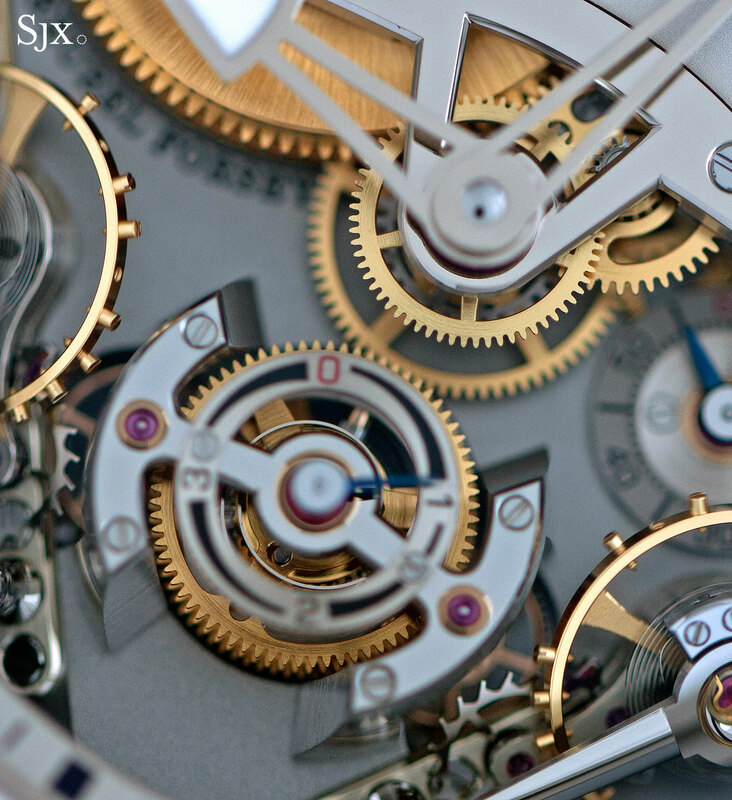 Almost all the action is on the front of the watch, save for the constant force mechanism. The spiral-shaped constant force spring from the back. The size of the watch is also typical of the brand’s house style, the white gold case a large 43mm in diameter, and just under 14mm high. It sits heavy on the wrist, with both tactile and visual presence. 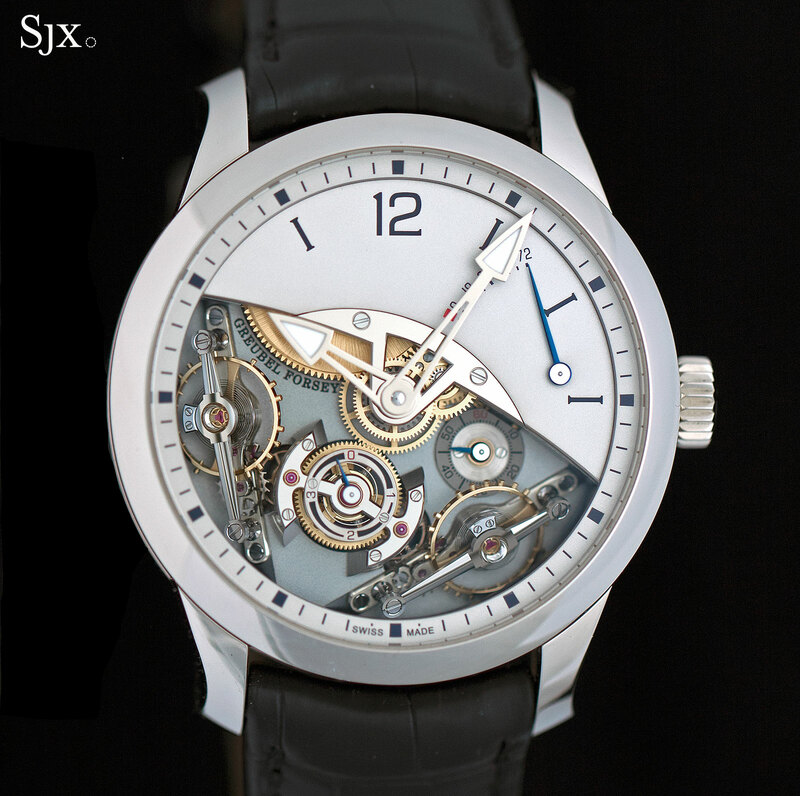 The Double Balancier à Différentiel Constant is a limited edition of 33 pieces in white gold, priced at SFr350,000. 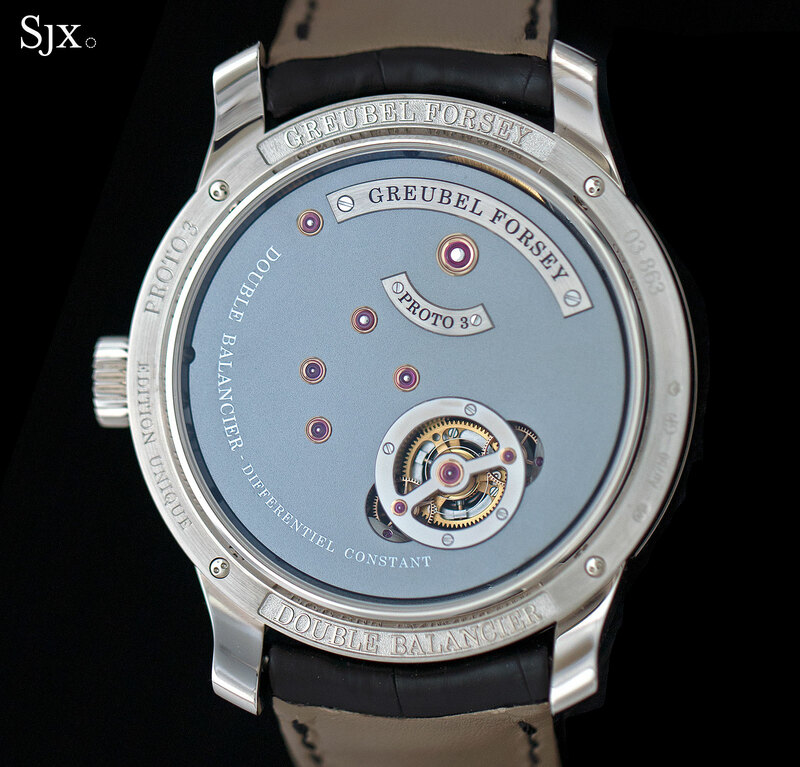 It’s available from Greubel Forsey retailers. 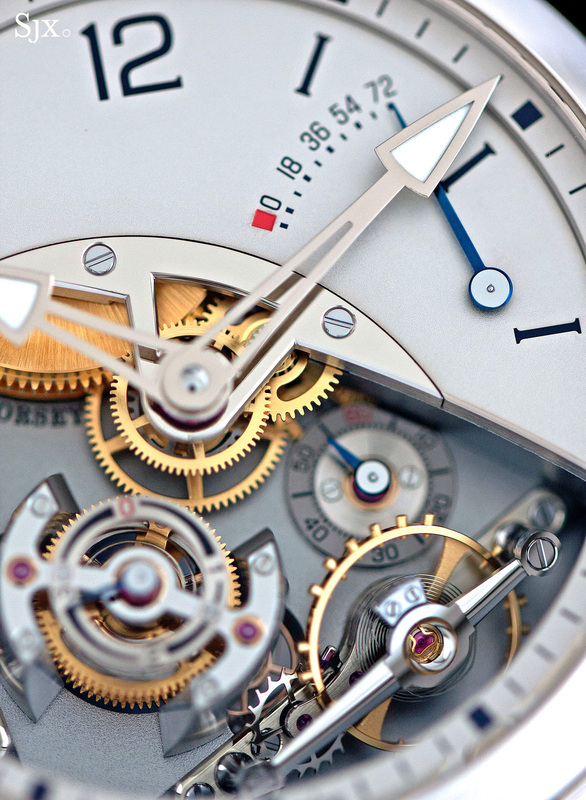 A disappointing Greubel Forsey GMT? The first ever sapphire crystal case wristwatch from Greubel Forsey. Specs and price below.